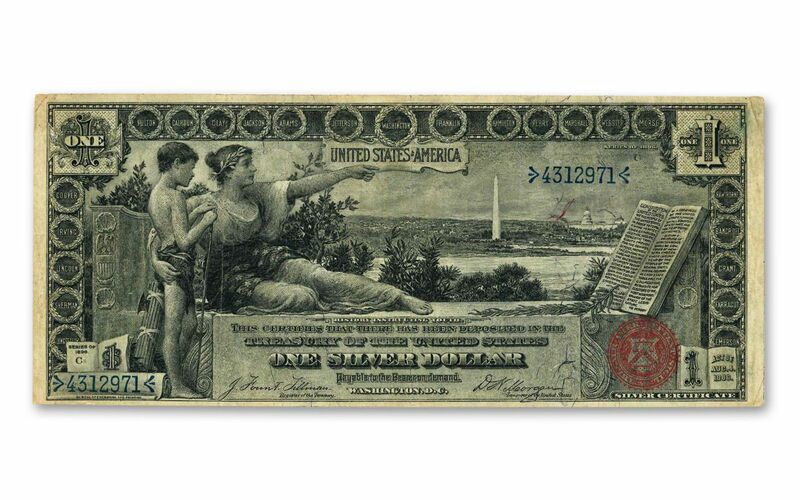 In 1896, the U.S. Treasury printed Silver Certificates with beautiful designs depicting educational motifs. Known as the “Educational Series,” each of these notes is a numismatic masterpiece. They’re also incredibly difficult to come by, which is why our buyer was so excited to locate these notes. We’ve managed to locate a $1 note showing allegorical forms of History instructing Youth on the front, paired on the back with a first and only in U.S. currency: the portraits of BOTH George and Martha Washington! 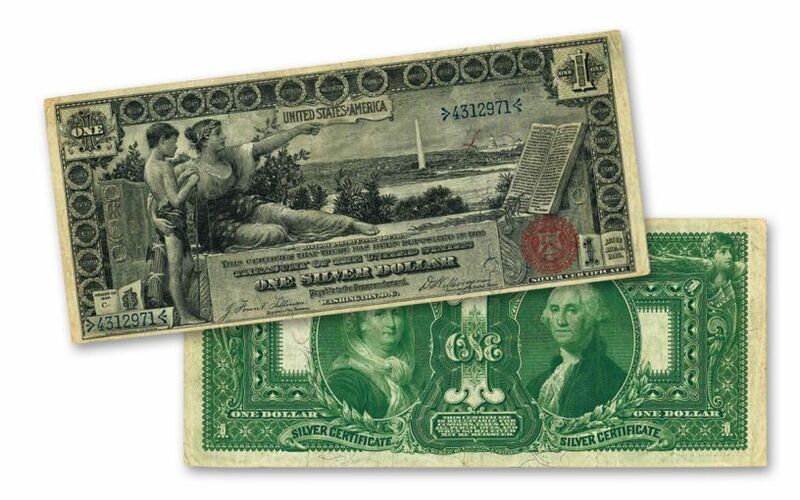 Due to their theme, these notes became known as “One Dollar Eds” and they feature much more than just History in the form of a reclining woman pointing towards a panoramic view of the Potomac River and Washington, DC with her arm wrapped around Youth represented by the figure a young boy. Besides the images of the Washington Monument and Capitol building, the United States Constitution can be seen on the right side of the bill. Additionally, the last names of important Americans are printed in wreaths that surround the front of the bill. Some of those listed include Benjamin Franklin, Thomas Jefferson, Robert Fulton and Ulysses Grant. Most of the people were included because of their artistic, cultural, or scientific achievements. In the book 100 Greatest Currency Notes by Q. David Bowers, the $1 Educational Note is ranked #7. Why? 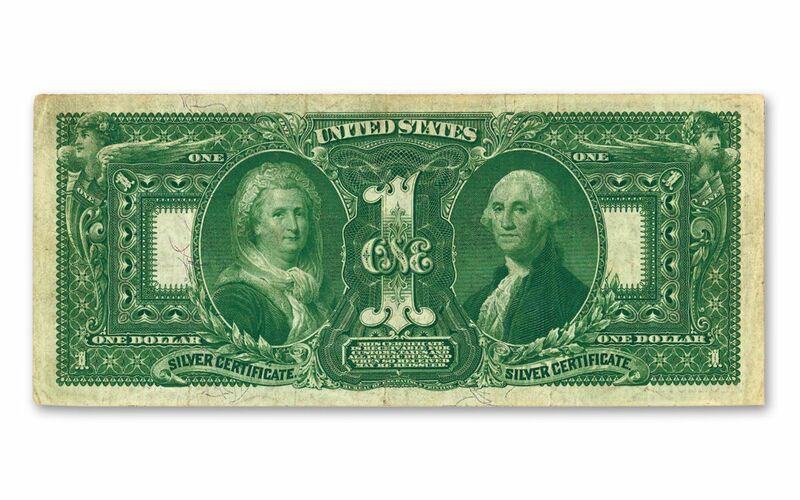 Well, in 1896, while nearly 20 million Silver Dollars were minted – many of which still survive in high grade – only an estimated 7,000 to 9,000 of these Silver Certificate Educational Notes are left in ANY grade! A genuine treasure, this note comes in nice Very Fine (VF) condition. As only a few thousand of these notes are estimated to still exist, the time to secure yours is now! Your note will come secured in a large-size hard acrylic holder and accompanied by a certificate of authenticity. Click it to your cart today!